Trust me; it’s very important to know what you are getting into. 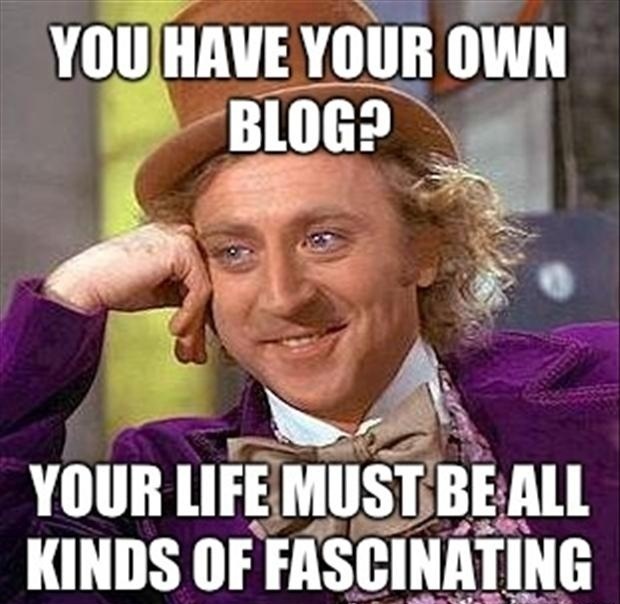 For me it started as a hobby and thanks to Google Blogger for the free platform, nothing could stop me. I just opened a Gmail account, then blogger and wah-la!I started posting - my images were positioned terribly, I knew nothing about editing …that the first few post looked terrible. I was just so excited that I could share something online. So when I saw the way these other bloggers shared their post I began to ask Google how I can make it look like that- I’m pretty sure they all started this way. The thing about technology is that, it upgrades and there is always something new to do. For you to be amongst the best you have to do as they do, and keep updating your blog – whether it’s the design, platform and all of that. The first year of blogging I was just joking around; I would post twice this month and would be gone for the next two months without knowing this affects traffic. After a year, I got a domain name since I noticed people were doing that but i was still not fully committed until the ending of the second year which was when I got AdSense. The funny thing was I didn’t even know I was finally approved until I started seeing ads on my site. Again, I had no clue about how to start earning from it, I just noticed it was on other sites and I applied for it. Though it’s good to have mentors and role models but what works for them might not work for you. So you just have to find what works for you and it comes down to ‘niche’… I’m sure you have seen this one on every other site about picking a niche. It’s not just about picking a niche; it’s about what you understand and have the skill for or what you just enjoy talking or in this case writing about. You just have to find out what you are passionate about and also ask yourself if you can create content on it regularly without feeling like it’s a chore. Also ,you have to decide what platform is best for you…This comes after research; cause from your research you would find out if Wordpress or blogger is good for you.. I mentioned these two platforms because they are the most popular. For some people that are not tech savvy, Wordpress can be complicated so they go for blogger while others that are tech savvy or have money to get a web developer, use wordpress (that is the wordpress.org). Consistency is the key to any successful business. When I talk about consistency here, I mean working with a routine and schedule that your audience can get acquainted to. From your strength and weaknesses, you would know how often you can post in a day, week or month…depending on the niche and work towards that rhythm. So before you start a blog, make sure you have at least 10 posts ready to be published so they can be scheduled at the proposed time. To be prepared you need to know what platform you need, what you want to publish (blog topic/niche), how to edit post, Google analytics, webmaster, search console, how to share automatically to your social media, getting a domain name, the best hosting companies; if you have the resources for it and are becoming an expert in your industry, how to monetize it –either with PPC or affiliates. ‘They say in order to get money, you need to spend it’ and it also applies in the blogging world. A lot of bloggers do different things to make money from their blog. Though they tell you ‘content is king’ which is true but you also need to do a whole lot – SEO (search engine optimization), email marketing and co… Besides, getting a domain and hosting is not free, you pay for that too. Though is not so expensive but imagine being unemployed that you don’t have a dime in your account, how can you pay for these things? My advice is, don’t try to quit your day job for blogging, instead take a percentage of your salary and invest in building your blog until it starts making huge income ,then you can quit and give it your all…full time. But if you are unemployed, you can still begin with a free platform like blogspot.com or wordpress.com until you get a paying job, then you can get a domain name and host it as time goes on. I have been blogging for six years; the first was a joke and the second was me learning new things and when I decided to be consistent ,my other job was taking my time that I wasn’t posting as I should. Then I thought it was the platform I was using so I hired someone to help me move it to Wordpress and that was the beginning of the site’s downfall. The engineer was unprofessional and when he moved it, I found Wordpress complicated that I had to ask him to take it back to blogger – all this happened in three to four months; I wasn’t sharing any post, was busy at my stressful job and it led to losing page views. And my AdSense earnings that was just picking up reduced drastically. There you have it! My people, blogging is fun, if you enjoy what you are writing about… I still have that blog because I enjoy what I am writing about but in terms of making money, I’m not even close to AdSense threshold. It can be really frustrating but I choose to keep at it, hoping to find my rhythm and just go with it. Not minding what people say and asking why I’m not as successful as these other bloggers. Therefore don’t make the mistakes I made with my first blog and do your research, make sure you are ready for it and give it your all.